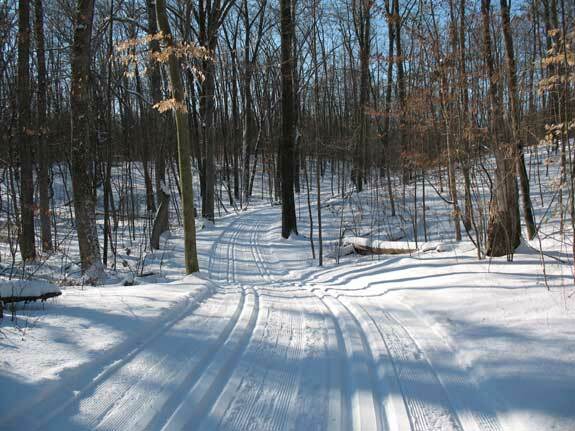 Huron Meadows Metropark is your Southeast Michigan destination for skate-style and classic cross-country ski trails. 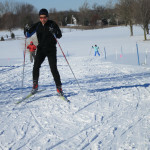 Choose from 14.8 miles of trails for classic skiing or nine miles of skate skiing. All trails are groomed daily. Also available is a 1.5 mile loop, Buck’s Run, covered with snow from our snow guns when weather permits. The trail is lighted at night and is often open even when natural snow is limited. 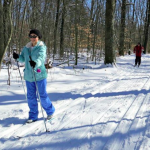 Huron Meadows offers spectacular scenery, easy to moderate terrain, ski rentals, warming building with snack and drinks, and of course, snow! The Ski Center (Golf Starter Building) features classic-style and skate-style ski rentals and a heated lounge, restrooms, and snacks. Groups of 10 or more can make arrangements to rent skis during the week. Sorry, dogs are not allowed on ski trails. Ski Rentals are available Monday – Friday: 11 a.m. to 7 p.m. and Saturday/Sunday: 9 a.m. to 5 p.m. (Weather/conditions permitting). Buck’s Run last groomed on 1/4/18. 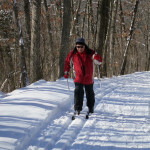 Buck’s Run is a 1.0 mile trail groomed for both classic style and skate style skiing. There is a $5 fee for the use of Buck’s Run, or if you are a regular user, we offer an annual use pass for $125. Golf course (Hawk Hills) is groomed. Showing some bare spots, but otherwise ski-able. South trails (South of Hammel Rd.) were groomed on 12/31. Golf course (Hawk Hills) has been groomed for skate and classic style cross country skiing.